Catherine Bailey is a London based actor. Catherine has a wealth of experience in TV, stage and radio. She has just finished playing Portia at The Globe in The Merchant of Venice, but prior to this she played a West Country butcher called Stephanie Weston in the latest series of Midsomer Murders. 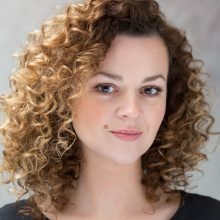 Her work ranges from playing a terribly well-spoken 1940s school teacher in the BBC series The Sarah Jane Adventures to Lucy, the cheeky cockney parlour maid, in the restoration comedy The Country Wife at The Theatre Royal Haymarket. She also played all the female roles, including a German Spy and Scottish famer's wife, in the award winning comedy The 39 Steps at the Criterion in the West End. Catherine’s most recently has worked on a Terence Davies film called 'A Quiet Passion'. She has worked on this film with Cynthia Nixon and it has just been named in the top ten films of the year by Rolling Stone. It will hit US and UK cinemas in April this year.